It has been said that he who does not study history is condemned to repeat it. With this in mind then, the history of the rise and fall of the Roman Empire must be especially instructive for the great powers of our own era. While it is not true that history repeats itself and cultures very widely over the centuries, yet the same virtues and vices cause the rise and fall of empires. Simon Baker presents us with the story of just such an empire rising and falling in his book Ancient Rome: The Rise and Fall of an Empire. This book, a companion to a series of documentaries on BBC, chronicles the rise and eventual fall of the Roman Empire. Simon Baker does not present a continuous narrative of all the centuries that Rome ruled the world. 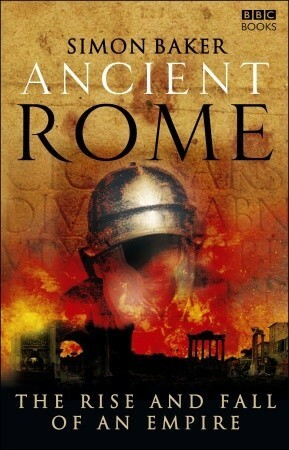 Rather, he focuses on about six key events or turning points of Roman history. He manages to present enough of the background history so that the reader who is not acquainted with ancient history is not at all lost. I am not sure if it was the author’s intent but if there is one lesson that I learned from reading Ancient Rome, it would be the importance of leadership. When the Roman Republic had good leadership, with Senators willing to make sacrifices for the common good, the Republic flourished and rose to rule the known world. When the Senators became corrupt and self-serving, the institutions of the Republic no longer worked. Then Julius and Augustus Caesar transformed the Republic into the one-man autocracy we call the Empire. The Empire worked well enough under good emperors such as Augustus and Hadrian. Under bad or incompetent emperors such as Nero, the system did not work so well. The lack of any firm rules for succession caused the Empire to nearly fall apart in the third century but, fortunately, the Emperor Diocletian was able to pull the Empire back together and Constantine gave it a reboot with a new capital, Constantinople and a new religion, Christianity. The Western half fell to the Germans in the fifth century, but contrary to the speculations of many historians over the centuries, there was nothing inevitable about that fall. The Goths were not trying to overthrow the Roman Empire. They were fleeing the depredations of the Huns and seeking a safe place to live. Wise leadership by the Romans would have enabled the Goths to become assimilated as Romans. However, there were no wise rulers in Rome and so the end came.